The Orfeo ToolBox provided applications to train a supervised or unsupervised classifier from different set of features and to use the generated classifier for vector data classification. Those features can be information extracted from images (see feature extraction section) or it can be different types of features such as the perimeter, width, or area of a surface present in a vector data file in an ogr compatible format. The TrainVectorClassifier application provide a way to train a classifier with an input set of labeled geometries and a list of features to consider for classification. The -classifier parameter allows to choose which machine learning model algorithm to train. You have the possibility to do the unsupervised classification,for it, you must to choose the Shark kmeans classifier. Please refer to the TrainVectorClassifier application reference documentation. In case of multiple sample files, you can add them to the -io.vd parameter. The feature to be used for training must be explicitly listed using the -feat parameter. Order of the list matters. If you want to use a statistic file for features normalization, you can pass it using the -io.stats parameter. Make sure that the order of feature statistics in the statistics file matches the order of feature passed to the -feat option. The field in vector data allowing to specify the label of each sample can be set using the -cfield option. By default, the application will estimate the trained classifier performances on the same set of samples that has been used for training. The -io.vd parameter allows for the specification of different sample files for this purpose, for a more fair estimation of the performances. Note that this scheme to estimate the performance can also be carried out afterwards (see Validating the classification model section). 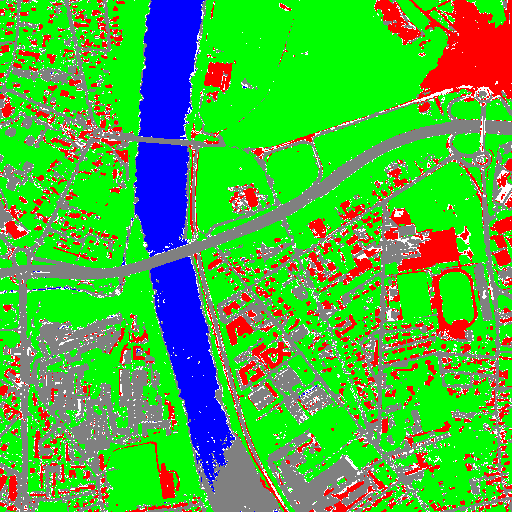 This application outputs a vector data file storing sample values and classification labels. The output vector file is optional. If no output is given to the application, the input vector data classification label field is updated. If a statistics file was used to normalize the features during training, it shall also be used here, during classification. Note that with this application, the machine learning model may come from a training on image or vector data, it doesn’t matter. The only requirement is that the chosen features to use should be the same as the one used during training. The performance of the model generated by the TrainVectorClassifier or TrainImagesClassifier applications is directly estimated by the application itself, which displays the precision, recall and F-score of each class, and can generate the global confusion matrix for supervised algorithms. For unsupervised algorithms a contingency table is generated. These results are output as an *.CSV file. The application will require the input image, but it is only used to define the footprint in which samples will be selected. The user can also provide a raster mask, that will be used to discard pixel positions, using parameter -mask. The -field parameter is the name of the field that corresponds to class labels in the input geometries. Now, we know exactly how many samples are available in the image for each class and each geometry in the training set. From these statistics, we can now compute the sampling rates to apply for each class, and perform the sample selection. This will be done by the SampleSelection application. Constant strategy: All classes will be sampled with the same number of samples, which is user-defined. Smallest class strategy: The class with the least number of samples will be fully sampled. All other classes will be sampled with the same number of samples. Percent strategy: Each class will be sampled with a user-defined percentage (same value for all classes) of samples available in this class. Total strategy: A global number of samples to select is divided proportionally among each class (class proportions are enforced). Take all strategy: Take all the available samples. By class strategy: Set a target number of samples for each class. 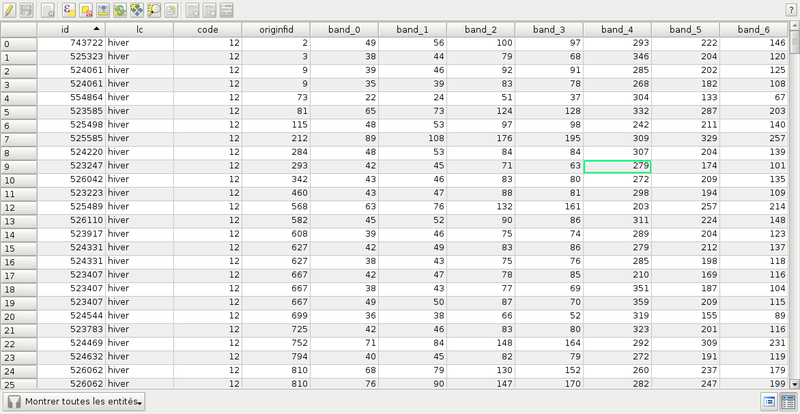 The number of samples for each class is read from a CSV file. Random: Randomly select samples while respecting the sampling rate. Periodic: Sample periodically using the sampling rate. The application will make sure that samples spans the whole training set extent by adjusting the sampling rate. Depending on the strategy to determine the sampling rate, some geometries of the training set may not be sampled. The application will accept as input the input image and training geometries, as well class statistics XML file computed during the previous step. It will output a vector file containing point geometries which indicate the location of the samples. This image shows the polygons of the training with a color corresponding to their class. The red dot shows the samples that have been selected. Now that the locations of the samples are selected, we will attach measurements to them. This is the purpose of the SampleExtraction application. It will walk through the list of samples and extract the underlying pixel values. 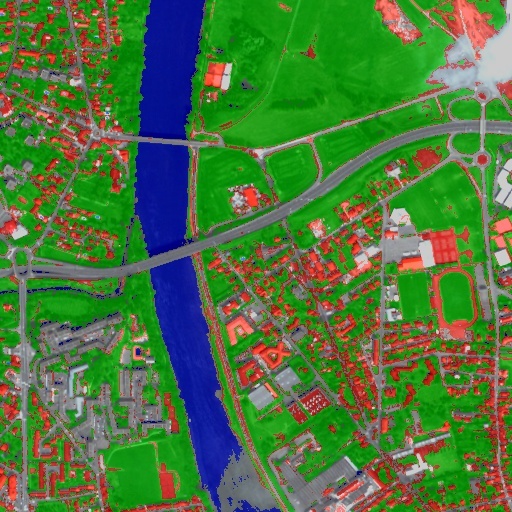 If no -out parameter is given, the SampleExtraction application can work in update mode, thus allowing to extract features from multiple images of the same location. Features will be stored in fields attached to each sample. Field name can be generated from a prefix a sequence of numbers (i.e. if prefix is feature_ then features will be named feature_0, feature_1, ...). This can be achieved with the -outfield prefix option. Alternatively, one can set explicit names for all features using the -outfield list option. Attributes table of the updated samples file. 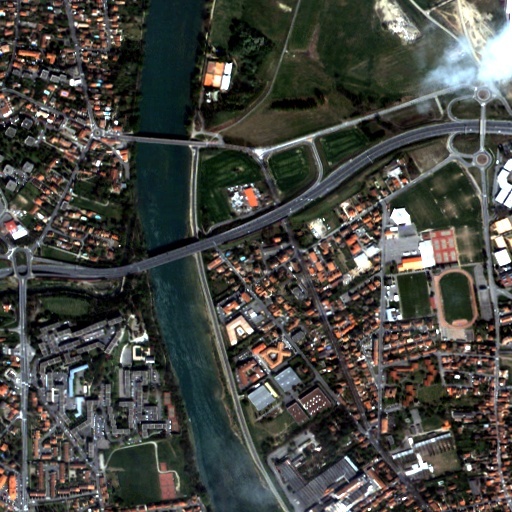 If the training set spans several images, the MultiImageSamplingRate application allows to compute the appropriate sampling rates per image and per class, in order to get samples that span the entire extents of the images. It is first required to run the PolygonClassStatistics application on each image of the set separately. The MultiImageSamplingRate application will then read all the produced statistics XML files and derive the sampling rates according the sampling strategy. For more information, please refer to the Samples statistics estimation section. Proportional mode: For each class, the requested number of samples is divided proportionally among the images. Equal mode: For each class, the requested number of samples is divided equally among the images. Custom mode: The user indicates the target number of samples for each image. The different behaviors for each mode and strategy are described as follows. and refers resp. to the total number and needed number of samples in image for class . Let’s call the total number of image. Samples extraction can then be performed on each image b y following the Samples extraction step. The learning application can process several samples files. Some machine learning algorithms converge faster if the range of features is or . Other will be sensitive to relative ranges between feature, e.g. a feature with a larger range might have more weight in the final decision. This is for instance the case for machine learning algorithm using euclidean distance at some point to compare features. In those cases, it is advised to normalize all features to the range before performing the learning. For this purpose, the ComputeImageStatistics application allows to compute and output to an XML file the mean and standard deviation based on pooled variance of each band for one or several images. The output statistics file can then be fed to the training and classification applications. Now that the training samples are ready, we can perform the learning using the TrainVectorClassifier application. In case of multiple samples files, you can add them to the -io.vd parameter (see Working with several images section). For more information about the training process for features please refer to the Train a classifier with features section. You can set an input mask to limit the classification to the mask area with value >0. The Orfeo ToolBox training applications provides information about the performance of the generated model (see Validating classification ). With the ConputeConfusionMatrix application, it is also possible to estimate the performance of a model from a classification map generated with the ImageClassifier application. This labeled image is compared to positive reference samples (either represented as a raster labeled image or as a vector data containing the reference classes). It will compute the confusion matrix and precision, recall and F-score of each class too, based on the ConfusionMatrixCalculator class. If you have made an unsupervised classification, it must be specified to the ConputeConfusionMatrix application. In this case, a contingency table have to be create rather than a confusion matrix. For further details, see format parameter in the application help of ConputeConfusionMatrix. Other look-up tables (LUT) are available: standard continuous LUT, optimal LUT, and LUT computed over a support image. We consider 4 classes: water, roads, vegetation and buildings with red roofs. Data is available in the OTB-Data repository . Figure 2: From left to right: Original image, result image with fusion (with monteverdi viewer) of original image and fancy classification and input image with fancy color classification from labeled image. Using the same machine learning framework, it is also possible to perform unsupervised classification. In this case, the main difference is that the training samples don’t need a real class label. However, in order to use the same TrainImagesClassifier application, you still need to provide a vector data file with a label field. This vector file will be used to extract samples for the training. Each label value is can be considered as a source area for samples, the same logic as in supervised learning is applied for the computation of extracted samples per area. Hence, for unsupervised classification, the samples are selected based on classes that are not actually used during the training. For the moment, only the KMeans algorithm is proposed in this framework. If your training samples are in a vector data file, you can use the application TrainVectorClassifier. In this case, you don’t need a fake label field. You just need to specify which fields shall be used to do the training. Once you have the model file, the actual classification step is the same as the supervised case. The model will predict labels on your input data. After having processed several classifications of the same input image but from different models or methods (SVM, KNN, Random Forest,...), it is possible to make a fusion of these classification maps with the FusionOfClassifications application which uses either majority voting or the Dempster-Shafer framework to handle this fusion. The Fusion of Classifications generates a single more robust and precise classification map which combines the information extracted from the input list of labeled images. The input pixels with the no-data class label are simply ignored by the fusion process. Moreover, the output pixels for which the fusion process does not result in a unique class label, are set to the undecided value. In the Majority Voting method implemented in the FusionOfClassifications application, the value of each output pixel is equal to the more frequent class label of the same pixel in the input classification maps. However, it may happen that the more frequent class labels are not unique in individual pixels. In that case, the undecided label is attributed to the output pixels. Let us consider 6 independent classification maps of the same input image (Cf. left image in Figure2) generated from 6 different SVM models. The Figure3 represents them after a color mapping by the same LUT. 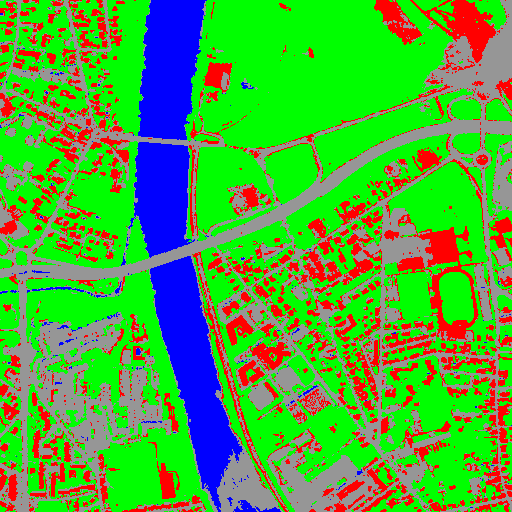 Thus, 4 classes (water: blue, roads: gray,vegetation: green, buildings with red roofs: red) are observable on each of them. Figure 3: Six fancy colored classified images to be fused, generated from 6 different SVM models. As an example of the FusionOfClassifications application by majority voting, the fusion of the six input classification maps represented in Figure3 leads to the classification map illustrated on the right in Figure4. Thus, it appears that this fusion highlights the more relevant classes among the six different input classifications. The white parts of the fused image correspond to the undecided class labels, i.e. to pixels for which there is not a unique majority voting. The FusionOfClassifications application, handles another method to compute the fusion: the Dempster Shafer framework. In the Dempster-Shafer theory , the performance of each classifier resulting in the classification maps to fuse are evaluated with the help of the so-called belief function of each class label, which measures the degree of belief that the corresponding label is correctly assigned to a pixel. For each classifier, and for each class label, these belief functions are estimated from another parameter called the mass of belief of each class label, which measures the confidence that the user can have in each classifier according to the resulting labels. In the Dempster Shafer framework for the fusion of classification maps, the fused class label for each pixel is the one with the maximal belief function. In case of multiple class labels maximizing the belief functions, the output fused pixels are set to the undecided value. In order to estimate the confidence level in each classification map, each of them should be confronted with a ground truth. For this purpose, the masses of belief of the class labels resulting from a classifier are estimated from its confusion matrix, which is itself exported as a *.CSV file with the help of the ComputeConfusionMatrix application. Thus, using the Dempster-Shafer method to fuse classification maps needs an additional input list of such *.CSV files corresponding to their respective confusion matrices. As an example of the FusionOfClassifications application by Dempster Shafer, the fusion of the six input classification maps represented in Figure3 leads to the classification map illustrated on the right in Figure5. Thus, it appears that this fusion gives access to a more precise and robust classification map based on the confidence level in each classifier. 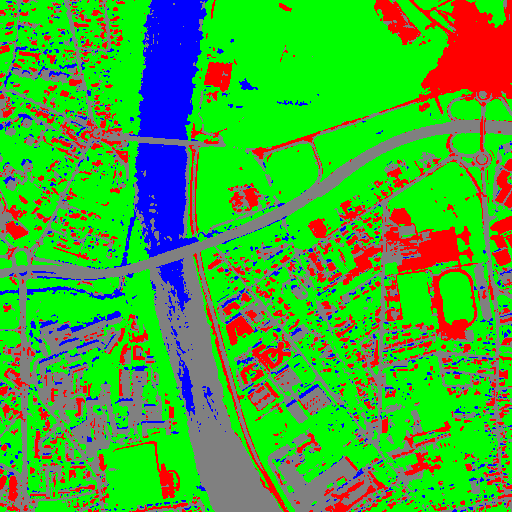 Figure 5: From left to right: Original image, and fancy colored classified image obtained by a Dempster-Shafer fusion of the 6 classification maps represented in Figure3 (water: blue, roads: gray, vegetation: green, buildings with red roofs: red, undecided: white). In order to properly use the FusionOfClassifications application, some points should be considered. First, the list_of_input_images and OutputFusedClassificationImage are single band labeled images, which means that the value of each pixel corresponds to the class label it belongs to, and labels in each classification map must represent the same class. Secondly, the undecided label value must be different from existing labels in the input images in order to avoid any ambiguity in the interpretation of the OutputFusedClassificationImage. Resulting classification maps can be regularized in order to smooth irregular classes. Such a regularization process improves classification results by making more homogeneous areas which are easier to handle. The ClassificationMapRegularization application performs a regularization of a labeled input image based on the Majority Voting method in a specified ball shaped neighborhood. For each center pixel, Majority Voting takes the more representative value of all the pixels identified by the structuring element and then sets the output center pixel to this majority label value. 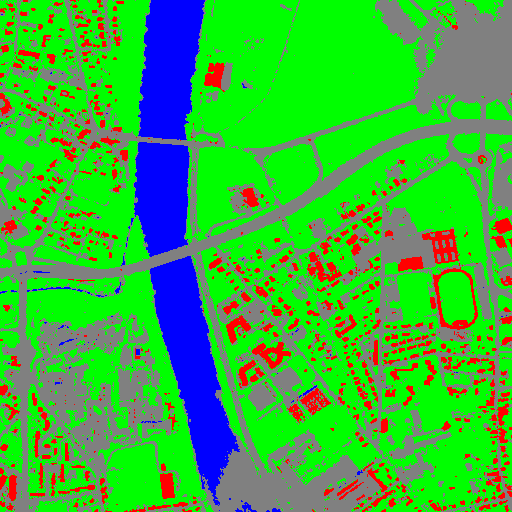 The ball shaped neighborhood is identified by its radius expressed in pixels. Since, the Majority Voting regularization may lead to not unique majority labels in the neighborhood, it is important to define which behaviour the filter must have in this case. For this purpose, a Boolean parameter (called ip.suvbool) is used in the ClassificationMapRegularization application to choose whether pixels with more than one majority class are set to Undecided (true), or to their Original labels (false = default value). Moreover, it may happen that pixels in the input image do not belong to any of the considered class. Such pixels are assumed to belong to the NoData class, the label of which is specified as an input parameter for the regularization. Therefore, those NoData input pixels are invariant and keep their NoData label in the output regularized image. -ip.undecidedlabel label for the Undecided class (default value = 0). In order to properly use the ClassificationMapRegularization application, some points should be considered. First, both InputLabeledImage and OutputLabeledImage are single band labeled images, which means that the value of each pixel corresponds to the class label it belongs to. The InputLabeledImage is commonly an image generated with a classification algorithm such as the SVM classification. Remark: both InputLabeledImage and OutputLabeledImage are not necessarily of the same type. Secondly, if ip.suvbool == true, the Undecided label value must be different from existing labels in the input labeled image in order to avoid any ambiguity in the interpretation of the regularized OutputLabeledImage. Finally, the structuring element radius must have a minimum value equal to 1 pixel, which is its default value. Both NoData and Undecided labels have a default value equal to 0. 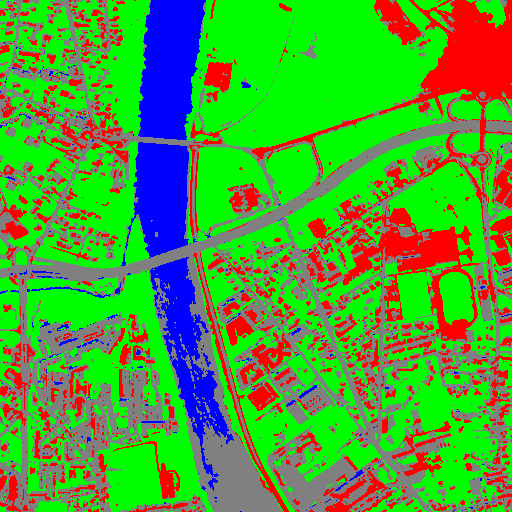 Resulting from the application presented in section Fancy classification results and illustrated in Figure2, the Figure6 shows a regularization of a classification map composed of 4 classes: water, roads, vegetation and buildings with red roofs. The radius of the ball shaped structuring element is equal to 3 pixels, which corresponds to a ball included in a 7 x 7 pixels square. Pixels with more than one majority class keep their original labels. The machine learning models in OpenCV and LibSVM also support a regression mode: they can be used to predict a numeric value (i.e. not a class index) from an input predictor. The workflow is the same as classification. First, the regression model is trained, then it can be used to predict output values. The applications to do that are and . Figure 6: From left to right: Original image, fancy colored classified image and regularized classification map with radius equal to 3 pixels. If you have separate images for predictors and output values, you can use the application. As in classification, a statistics estimation step can be performed before training. It allows to normalize the dynamic of the input predictors to a standard one: zero mean, unit standard deviation. The main difference with the classification case is that with regression, the dynamic of output values can also be reduced. If you use an image list as training set, you can run application. It will produce a statistics file suitable for input and output normalization (third option). Initially, the machine learning models in OTB only used classification. But since they come from external libraries (OpenCV and LibSVM), the regression mode was already implemented in these external libraries. So the integration of these models in OTB has been improved in order to allow the usage of regression mode. As a consequence , the machine learning models have nearly the same set of parameters for classification and regression mode. The behavior of application is very similar to . From the input data set, a portion of the samples is used for training, whereas the other part is used for validation. The user may also set the model to train and its parameters. Once the training is done, the model is stored in an output file. The model to use is read from file (the one produced during training).